There are many different options out there when it comes to choosing a material for your kitchen countertops. You have probably noticed when doing your research on each one, lists of pros and cons pop up everywhere. There is one though, that seems to have lots of pros to outweigh the few cons: stainless steel countertops. Stainless steel countertops: a world where beauty meets functionality. They can work in any kitchen, whether it is traditional or contemporary. 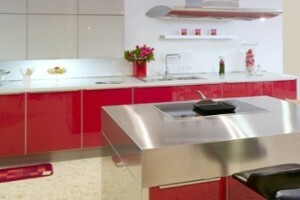 In terms of color and design, stainless steel is considered a “neutral” which matches any kitchen décor. They actually make wood cabinets stand out beautifully and accompany your stainless appliances with class. Stainless steel is an alloy of steel combined with an element called chromium, which is what gives this material such great resistance. It is resistant to rust, heat and any type of corrosion. Although stainless steel does not chip or crack; if installed improperly can dent. It can also scratch- but scratches can be easily buffed out of your countertops. One of the initial challenges for choosing stainless for your countertop material is that on the pricing scale, they come in on the high end; however this can be thought of as a great value over time, since it could potentially last you a lifetime (they can last up to 100 years). There is no build up of germs with stainless steel, as it is a non-porous material, making it resistant to water, dirt, bacteria and odors. Because of this, it’s one of the most hygienic surfaces for preparing foods. There is also minimal maintenance with this material, no harsh chemicals required. They can be cleaned with soap and water, and items such as vinegar and baking soda will restore the shine if they dull over time. So why not give stainless steel countertops a try? They come in a variety of finishes and textures-and with so many great benefits and easy up-keep, it is easy to see why they are becoming so popular. If price is hindering you, check with your local dealer to see if there is anything they can do to help you make it work. Sometimes, they just may surprise you.